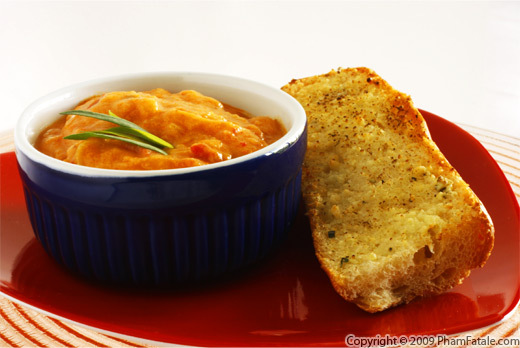 Chowders, like many other Western soups, are thickened with a roux. A roux is a combination of flour, butter and milk. 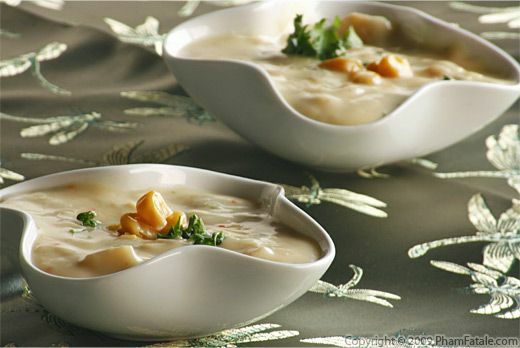 To make corn chowder, just add corn kernels and some diced potatoes for texture. It couldn't be simpler than that! I think chowder comes from the French word chaudière, which is the name of the pot in which the soup is made. It seems though, that the dish first gained popularity in New England. Traditional chowder is prepared with seafood, but I only had some fresh ears of corn on hand. After making countless corn salads, grilled corn on the cob and desserts, it was time to make some good ol' comfort food for dinner. Boiling the potatoes: Wash and scrub the potatoes. Put about 2 inches of water in a pot and place the steamer insert. Bring the water to a boil. Place the potatoes in the steamer. Cover and cook for about 15 minutes until tender. A good way to check is to pierce the potatoes with a pairing knife. 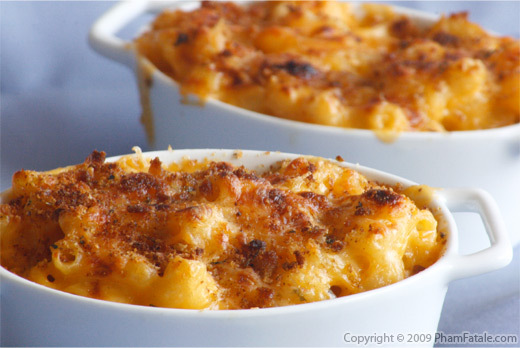 As soon as they are not too hot to handle, cut the potatoes into 1-inch cubes. (if you want, you can peel the potatoes, I don't). Set aside. Preparing the corn cobs: First, grill the corn: Brush the corn cobs with a little olive oil, using a silicon brush. Place the corn on a hot griddle. Cook until you get grill marks (about 2 minutes on each side) over medium heat. As soon as the corn is grilled, season with salt and pepper. Remove from the pan. Cut the corn kernels off the cobs, using a sharp chef's knife. Reserve the cobs for the broth and about 2 cups of corn kernels for garnish. Set aside. Preparing the chowder: In a large pot, heat the remaining olive oil. Add the shallot and onions. Cook for a few minutes until translucent. Transfer them to a platter and set aside. Making the roux: In the same pot, melt the butter over medium-low heat. Add the sprig of thyme. Turn off the heat and let sit for 5 minutes. Remove and discard the thyme. Bring the heat back up to medium-high (the butter should be hot and golden).Wait until it's hot, then add the flour. Keep stirring with a whisk for approximately 2 minutes. The flour should absorb the butter instantly and form a paste. Add the milk and a cup of heavy cream. Increase the heat while constantly stirring for about 2-3 minutes. Lower the heat to low. Add the corn cobs, golden onions, red chili flakes and turmeric. Cook for another minute, then add the vegetable broth. Bring the mixture to a boil, stirring occasionally for about 15 minutes. Infuse the corn cobs and let sit for about an hour. Assembly time: Remove and discard the cobs. Add 6 cups of corn kernels, 3 cups of diced potatoes and the pecorino cheese. Season with salt and pepper. Cook for another 5 minutes. Using an immersion mixer, purée the corn kernels until the texture is smooth and creamy. Finish with the remaining heavy cream. Add the remaining corn kernels and diced potatoes. 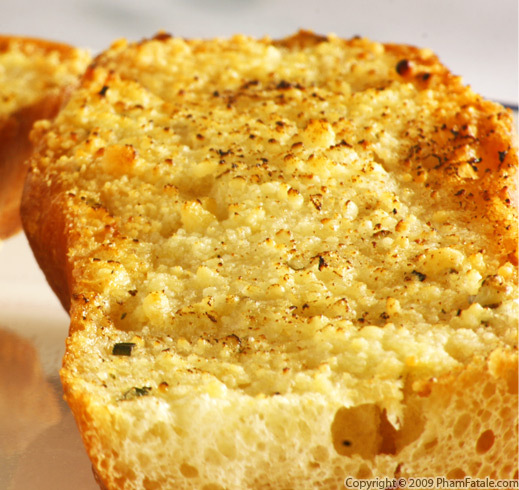 Serve warm with some garlic parmesan bread. Garnish some parsley (if you want). I like using pecorino cheese. It has a stronger, sharper flavor than other hard cheeses such as parmesan. I also like the straw yellow color for a natural coloring of the soup. Don't put too much turmeric; I use it as a natural food coloring that makes the corn chowder look more vibrant. To get a homogenous roux, I always use all the ingredients at the same temperature, so make sure you heat the milk in the microwave (or in a saucepan), so it's warm. If you get lumpy pieces in the sauce, don't hesitate to use a handheld blender. Published By: Jacqueline Pham on August 22, 2009. Just delicious!! When I lived in Boston, I ate chowder all the time. I loved it. And with all the lovely fresh seafood in the New England area, you couldn't go wrong. This one looks so wonderful....it has taken me back! Wow, Jackie, you post so many recipes its hard to keep up with it all. Between one of my visits to the next, you just zoom by :) I love all your last few posts. Looks fantastic! I love chowders as well. I Like your bowls too! I bought the bowls at Crate and Barrel. Hope this helps! What a great recipe! Thanks for the tip on the roux -- it's always hard to get a smooth roux. I love corn chowder, it's so good. This looks really great and the bowls are gorgeous! If you haven't already, we'd love to have you join the Food Bloggers discussion list! You can join here http://groups.yahoo.com/group/foodblogs/ or via email by sending a message to foodblogs-subscribe@yahoogroups.com Hope to see you there! so...I now I am in a quandry. We are having a 100 mile banquet at work for someone who just got married....you know...produce within the 100 mile of where one lives. 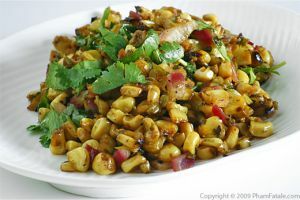 Corn is a plenty right now and I was going to make a curry corn dish...but this looks soooo good! How delicious this is and a wonderful way to use up the bounty of fresh corn that is available right now! Love corn chowder. Now if only the weather gets cooler over here. This sounds delicious! I love chowder and I love how this sounds so easy!! !